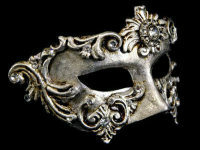 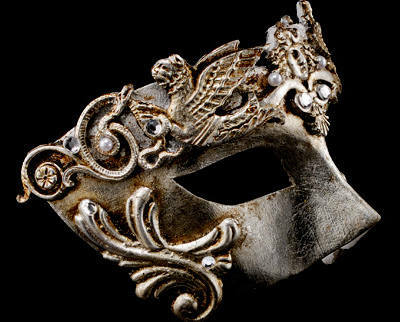 A timeless style that will never go out of fashion, this stunning silver Grifone Luxury Venetian Masquerade Ball Mask has been re-designed to give it a modern yet traditional edge. 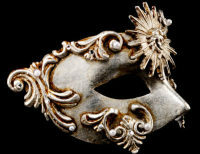 Suspended from a delicate 9ct white gold chain, this beautiful mask comes in antique silver and adorned with delicate designs & Faux diamond crystals. 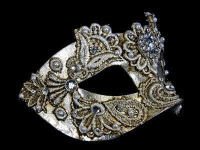 Elegant and sophisticated, this lovely pendant can be worn by both men & women to a masked ball or party. 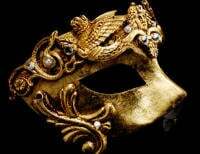 Colours and patterns will vary slightly on each mask & please remember these ball masks are aged so do not look in as new condition.